Mikey Garcia, one of the best fighters in the world pound for pound, has won world titles in three weight classes — featherweight, junior lightweight and lightweight. Now Garcia will shoot for a belt in a fourth weight division. 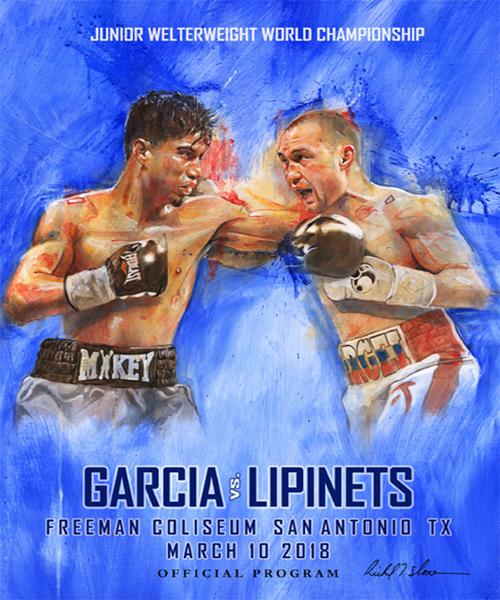 Garcia will challenge Sergey Lipinets for his junior welterweight world title tonight in the main event of “Showtime Championship Boxing”, which was originally scheduled for February at the Alamodome but was pushed back exactly one month when Lipinets suffered a minor right hand injury in training. “When we learned that Sergey had a strain and not a major injury, our best option to reschedule the fight as quickly as possible was to go to the Freeman Coliseum,” Ringstar Sports promoter Richard Schaefer said. “We wanted to keep the event in San Antonio, where they have great fight fans. The event was selling like hotcakes at the Alamodome, so I’m happy we were able to keep the fight in San Antonio. Garcia (37-0, 30 KOs), 29, of Moreno Valley, California, spectacularly knocked out Dejan Zlaticanin in the third round in January 2017 to win a lightweight world title. Then he moved up to 140 pounds and took on former four-division titleholder Adrien Broner on July 29 and routed him by unanimous decision. Garcia said after the fight that he would either return to lightweight or remain at junior welterweight — or even go to welterweight — for the biggest fight he could make. He will be staying at junior welterweight, at least for his next bout, to challenge Lipinets. If Garcia wins, he would become just the third fighter in modern history to win titles at 126, 130, 135 and 140 pounds, joining future Hall of Famers Manny Pacquiao and Juan Manuel Marquez. Lipinets (13-0, 10 KOs), 28, a Kazakhstan native fighting out of Beverly Hills, California, won a unanimous decision over Japan’s Akihiro Kondo for a vacant junior welterweight belt on November 4 at Barclays Center in Brooklyn, NY, and will be making his first defense against Garcia.